The building totals 5,792 sq. ft. on main level & 960 sq. ft. on lower level. It has 2 completely equipped kitchens, 16 bedrooms (potential efficiency living in lower level), four 3/4 baths and two 1/2 baths plus one 1/2 bath in basement, and 2 laundry rooms. New addition was completed in 1995. New water heater 2008. The following improvements were done West side 2007, East side 2008: new furnaces. remodel (new light fixtures, repairs, interior paint, new carpet). Exterior painted, new appliances, outside storm windows, laundry room remodel in 2009. New roof over 3/4 of the building in 2010. Building has fire protection sprinklers and also a yard sprinkler system. 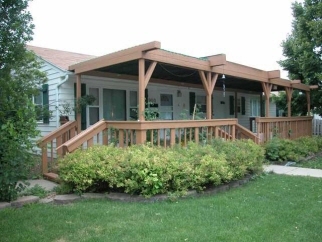 This property offers easy access to bus stop, interstate, restaurants, and grocery stores. There are 15-20 parking spaces on site. Owner is responsible for exterior building maintenance (roof, siding, plaster, exterior paint), furnace, water heater, sprinkler systems, taxes, and building insurance.